When people ask me how many (live) chickens I've got, these days I answer '5 and a half', or 'almost 6' - five chickens and an identity-challenged duck. I've had as few as 2 chooks, and as many as 10, depending on the season. Today I've been trying to get a pic of all of them together, but they are NOT co-operating! The backdrop pic for this blog is a little old and so a couple are different now. The undisputed leader is Betty, a Buff Orpington bantam X who is the last of our original pair of hens, acquired back in 2005. She's the orange head in the bottom right corner of the backdrop. The most popular with the kids is Justine, as she's the only one who'll let people pick her up. My DD (age 4) is often to be seen carrying Justine around the garden, which is funny because Justine is a large hen and DD is only a couple of feet tall herself!. My naughty girl Justine - too smart for her own good! Hetty is the big white hen on my bac, and we also have two grey Aracaunas (both imaginatively called Little Grey), who are bantam types that look a bit like vultures! Ugly chooks, but they lay the cutest tiny blue-shelled eggs. And of course, there is Rosie the Indian Runner duck, who was raised by bantams and thinks she's a chicken. 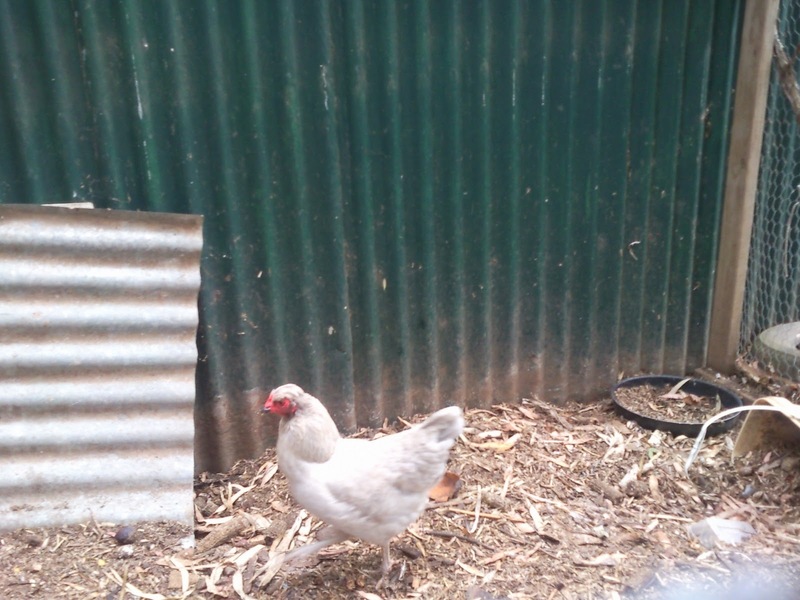 A friend keeps ducks and chooks and there was an egg mix-up, so Rosie hatched under a hen - oops. All was fine until she grew taller than the flock rooster, who kept pecking her. My friend tried putting Rosie in with the ducks, but she just stood at the gate quacking to go back into the bantams, so I was asked to re-home her. 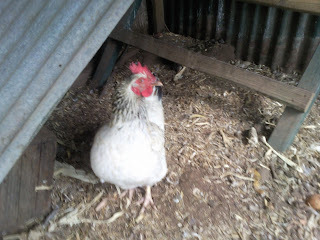 My hens really do treat her just like any other chook, and she follows them around all the time, quacking loudly. When I open the back door in the morning, she knows the sound and quacks 'hello' in her distinctive ducky voice! Love hearing the sound of your chooks/duck when the back door is open and we are visiting . . . sitting in the kitchen sipping tea (and often something a little bit stronger).